Tirau is a small town in the Waikato region of the North Island of New Zealand, 50 kilometres southeast of Hamilton. The town has a population of 732 (2006 census) (726 in 2001 and 735 in 1996). Tirau is primarily a farming town but in recent years has begun to exploit the income that comes from being on a major road. 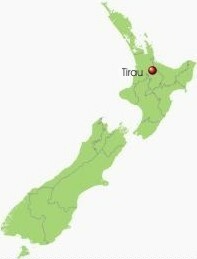 Tirau is Maori for "place of many cabbage trees." Tirau is a major junction in the New Zealand State Highway network. Just south of the township is the intersection of State Highway 1 and State Highway 5, where traffic from Auckland and Hamilton split to go either to Rotorua (SH 5) or Taupo (SH 1). In the 19th century, Tirau, then Oxford, was originally planned as a large-scale city for the Waikato, however plans were changed after the entrepreneurial Rose family bought up large volumes of land in the region, with the intention of making large returns when it came of high demand. Oxford later became a rural service town, and changed its name to Tirau in 1896. By the late 1980s Tirau was fast becoming a ghost town. In 1991, local business man Henry Clothier sought to advantage from the relatively cheap real estate and high traffic volume in the town by opening an Antique shop in the former Rose Bros. grocery store building. Many other businesses followed suit off the back of his success throughout the 1990s until today. Tirau has built a reputation as a shopping destination for antiques, collectibles and other niche items. In 2005/06 the South Waikato District Council is working, on behalf of the Tirau Ward, in conjunction with the community, to develop a concept plan for Tirau's future. This project is taking the success of Tirau's transformation over the past decade and linking it with the requirements of the Local Government Act 2002 new emphasis on the four well-beings, social, economic, environmental and cultural. dog' and 'big sheep' buildings. The town is now a well known tourist stop-off, and is characterised by many local art works in the town forged out of discarded corrugated iron. In 2000 ‘The Castle’ opened in Tirau, a large toy museum on the towns southern limits, which is in clear view when heading through the township from Rotorua or Taupo. 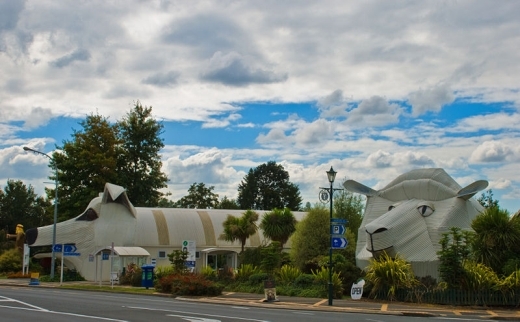 Among its other well known sights are the information centre shaped like a giant dog and 'the big sheep', a large wool outlet, both made out of corrugated iron. Many of the shops in the town also possess large corrugated iron sculptures and the church has a giant shepherd also made out of corrugated iron.